Today could be the last day I ever see St. Francis Xavier Girls Secondary School and all of the amazing girls that go there, but I sincerely hope it isn’t. I have so many memories from these past three weeks, although there are a few that I wouldn’t mind forgetting. The very first time I was woken up at six to shower in a bucket, I had no idea how. (Actually I still don’t, I just pour water on myself and hope I’m getting clean). Anyway, when I asked Abby, my cube-mate and a best friend, whether I was supposed to leave my flip-flops on, she said I was. The huge sandals barely fit in the tiny bucket and I found myself “showering” on tiptoes, which was very uncomfortable. Later, I realized I wasn’t supposed to wear sandals, and I was sufficiently made fun of. I even told a few teachers who asked about my experiences and we laughed and laughed about how silly it was. Lots of girls wanted to talk to me during my stay, so most nights my tiny cube, St. Daniel, was filled with curious visitors. I loved the company, but unfortunately guests weren’t allowed in the cube after evening preps, so sometimes I’d open my door and find a girl “borrowing some shoe polish” or “looking for her skirt”. (Mr. Murigi, aka Peter or Deputy, ignore those last two sentences J) But no matter what shenanigans were going on in St. Daniel, my cube mates always had my clothes laid out, bed made, and shoes shined before I could protest. I had to announce in advance that I was going to polish my own shoes, and everyone else’s too. They all laughed when I fumbled with the brush and wrinkled my nose at the black smelly goo I was trying to apply. I hardly see the point when the second I step outside, I’m covered in dust and dirt. Oh well. I got to have a class with almost every teacher and really enjoyed meeting all of them. It was fun to see their different teaching styles and give lectures without the convenience of PowerPoint, a SMART Board, an overhead projector, or even a whiteboard. The teachers use the blackboard for everything and there are no printouts or worksheets, so the students write down everything in notebooks. In math, they copy every problem word for word, even writing ‘In the figure below’ before drawing it on the facing page. Some classes I looked forward too, and some I didn’t. Biology with Sister Magdalene was always fun because she’s such an energetic teacher, but Kiswahili was a little boring because I didn’t understand anything. I’ve picked up a few words, but not enough to know what anyone is saying unless it’s one of the many forms of hi. (jambo, habari/habariako, sasa, mambo, hujambo etc. to which the responses are mzuri, poa, or sijambo). On my last day as a student, Wednesday, I discovered I wouldn’t be taking my meal with the matron as usual because she was with a patient. Since Granny was going to have lunch with us, I went to tell her so she could enjoy the usual githeri (maize and beans) with the rest of the staff. I’m using “enjoy” sarcastically because although Kenyans love it, Granny and I are used to very different food. Anyway, I got into lunch late and first had to subtly slide my beans and kernels onto my table-mate’s plates without their noticing. I eat some of it, but by Kenyan standards, it’s nothing, so I sometimes cheat to clear the plate. I took my time washing and drying my plate, since it was to be my last time, and headed back towards class. Outside the dining hall, I saw two of my classmates kneeling before Madam Pauline, my math teacher in 3A. I thought “Wow, I’m glad that’s not me, they must have done something really bad like leave their sweater on during lunch or have a wrinkle on their bed sheets this morning,” as I jogged by. Then, Pauline pointed at me, then at the ground, and I realized that I was being punished as well. Confused, I joined my friends on the dusty grass, wondering what on earth I’d done. More girls left the dining hall, and each was made to kneel on the ground behind me. They were each shocked to see me, and a few whispered “sorry” in my ear. I felt humbled, just another Kenyan student subject to what Granny calls ‘torture’. Pauline told me that lunch ended at 1, and apparently it was some time after that, so I was being punished because of it. I hadn’t even heard of such a rule, nor did the dining hall have any clock that I could see. Not only that, but after lunch we had free time in our classroom, there weren’t lessons for more than twenty more minutes. I knew I didn’t deserve to kneel, but I also knew that none of the other girls did either, so I knelt silently until we were given the signal to go. The signal was actually in Kiswahili, so I just followed the other girls getting up and hoped she hadn’t said, “you can leave if you want to clean the latrines instead,” or something of that sort. The kneeling wasn’t all, however. There were about 20 of us who had come out late, and we were to scrub and sweep every single classroom that afternoon. I didn’t end up doing so because 1) I was packing my things and 2) Granny was p-i-s-s-e-d. We both disagree with any form of physical discipline, but kneeling before a teacher was an unforgettable experience for me and I have no hard feeling towards Madam Pauline. Before I left, I handed out a picture of myself to every student (by request, I don’t think I’m some kind of celebrity) and made a farewell announcement at dinner. My real last day was today, Sunday, when I returned to bake cookies, but I haven’t gotten there yet. On Thursday, Granny, Ben, Jecinta and I returned to the Maasai Market in Nairobi to purchase more goods for y’all. I bought some tribal looking trousers, a long pink skirt, some bracelets for my friends back home, and picked out a bunch of earrings, necklaces, and magnets for Granny to sell. The next day, Granny, Principal Ruth Kahiga, and I picked out a fridge for the matron, Esther, who had been wonderful to me and prepared my meals during my last week. I already miss her cooking L. On Saturday, Granny and I rode piki-pikis (motorcycle taxis) to the big, open-air market. I’d expected the piki-piki ride to be exciting, but Granny made sure they drove so safely that there was no thrill at all. The big market had tons of clothes, and I found several cute tops to wear here or at home, based on Granny’s internal modest-o-meter. We bought a papaya, some veggies, and found the very last mangos of the season in a stall at the very back of the market. We bought three, and have already eaten one. 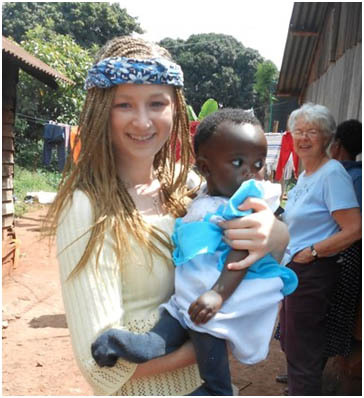 Afterwards, I decided I wanted to get my hair braided Kenyan style. I’d gone to a salon before with Catharine’s daughter Laura, and Granny was much more impressed with her elaborate corn rows than my blow-dried hair. It took us a while to find the same salon, but when we did, the owner said she could braid my slippery mzungu hair and wouldn’t charge me too much- 800 shillings (~$10). One salon that Jacinta called said ksh 3,000! Mzungus are charged completely outrageous prices sometimes. Getting my hair “plaited” took three hours. My scalp hurt, my neck was sore from having to bend over, and I was kinda bored. But finally, my hair was all braided, and with extensions to make my hair an easier texture for them. I felt very African. This picture is me with my braids, I’ll explain where I am in the next email. It’s now Tuesday and I have since taken them out but they were fun while I had them, I just missed my natural hair too much. The kids at Mi Wa Neema had lots of fun taking out my braids and saving the extensions for Ruth, a hairdresser in training. Simon, Lucas, Tylon, Grace, Ruth, Agnes, Julia and I were all working on my head at one point. I’d say “ow” and they’d all say “where?” to make sure it wasn’t them who was pulling to hard. When all my braids were out, my hair looked like a huge mane of poodle fluff. Everyone kept asking me when I was going get it washed, blow-dried, and straightened at the salon so it could go back to normal. They couldn’t believe that water would straighten it right out. The girls stayed up until I got out of the shower to see the transformation. I told them all I used was shampoo and conditioner and they asked if that was what made the air outside my room smell so good. I let them sniff my conditioner and they liked it so much that they squirted some straight onto their heads. 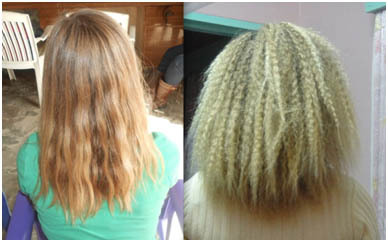 My natural hair (left) and my hair after being in braids (right). The color is off because the pictures are from different cameras and in different lighting. Sunday evening was my last appearance at SFG. I arrived around 4 and greeted the staff and my friends, most of whom were in the dining hall enjoying their free time. On Sundays, the girls have a few hours of ‘entertainment’: listening to music on the radio or CDs, hanging out on the quad or field, playing sports, or watching whatever show is on the tiny TV. I say watching because there are about six rows of students seated in front of the TV but only the first two can actually hear. They don’t seem to mind, and I love how they get excited about the littlest things. It’s nice to see teenagers grateful for what most Americans I know wouldn’t tolerate. I know I’m guilty too. If I couldn’t hear my TV shows, I wouldn’t watch them. I’d probably complain until it was fixed, and be honest, you probably would too. As I had arranged with the cateress, the bakers (a group of about 10 girls who prepare the bread daily) were in the kitchen and eager to bake cookies. I’d bought baking powder, baking soda, vanilla, eggs, and cooking fat, although they had plenty of the latter. I borrowed some of that, flour, sugar, and more eggs from Mr. Murigi, who has his own chickens. The recipe I copied that claimed to make 300 cookies produced a surprisingly small amount of dough, so we ended up making two more. The girls had lots of fun kneading the dough with their hands and shaping the round balls on the trays. When the cateress wasn’t looking, they made silly shapes and ate them. In the end, we made over 300 cookies so every girl got one and the bakers got extra. It was a fun way to say goodbye. 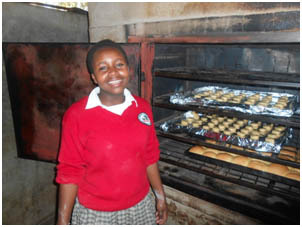 This is Beatrice, the baking Prefect, in front of the big wood burning oven. The first two sheets of cookies are on the top, and the scones they were previously baking for Monday’s breakfast are on the bottom. It is breakfast-time. I am eating boring breakfast cereal and am enjoying, once again, the adventures of Margo and Maya in Kenya! THANK YOU!! Maya, You have a beautiful voice in your writing! Btw, thanks for taking the time to write your memory of Mrs. Piazza. I know she’d be so proud of you!